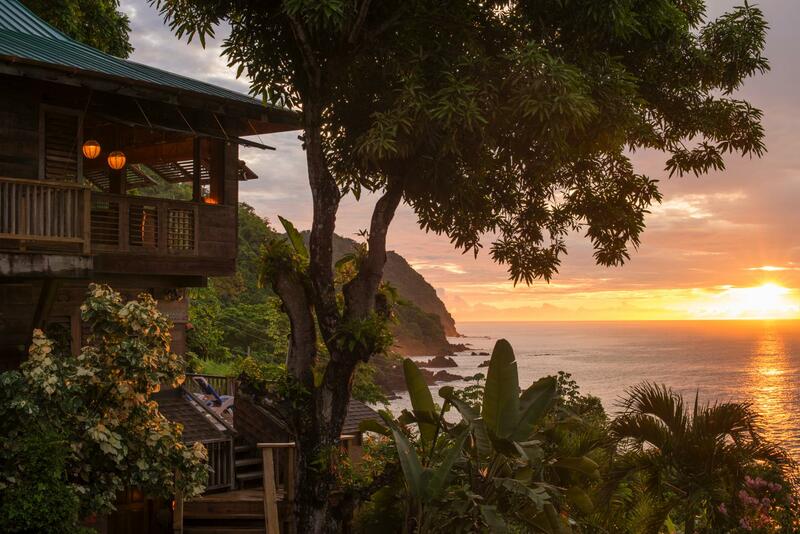 Nestled on the hillside with rainforest as a backdrop, and the ocean below, our eco lodges on the edge of the Caribbean village of Castara invites you to enjoy a ‘living in the landscape’ experience in one of our 16 treehouse-style, self-catering accommodations. Each is built in perfect synthesis with the lush surrounding environment, and angled to absorb the glorious views of the Caribbean Sea. We invite you to experience the tropical paradise in this unspoilt corner of the Caribbean that so captivated us 16 years ago. We aim to create a balance between the services of a hotel with the freedom of self-catering. If you are looking for five star luxury in an exclusive Tobago hotel, we’re likely to be not for you. But if it is a more subtle sort of luxury you seek, our tropical hideaways capture the simple, exotic essence of Tobago and exude creativity and style. You will find all you need to unwind and recharge. Comfort is paramount with open-air bedrooms, hammocks for lounging, and expansive decks; we strive to deliver a level of quality that sets us apart. Our local team – led by charismatic Porridge and his wife Jeanell –will do all they can to ensure your stay is a happy one. They have created an intimate, friendly atmosphere around the place, and will call by your accommodation most mornings to say hello and check all is well. 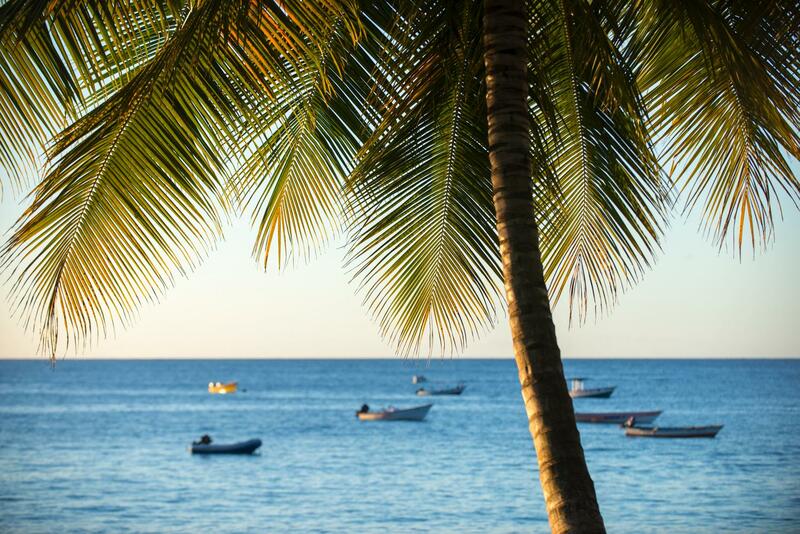 Their openness of spirit helps guests connect with the relaxed Tobago ‘go slow’ attitude that has beguiled so many. Strolling down to the village, you’ll find a friendly local vibe and an invitation to experience the relaxed rhythms of Caribbean village life. The Times list us in their TOP 50 Best Holidays in the Caribbean. Being in Castara encourages a healthy lifestyle: daily strolls up and down the hillside, dips in the ocean, and a diet of fresh fish, mango and avocado, result in our guests feeling relaxed, nourished and nurtured. For those needing a little extra help unwinding, our network of experienced wellness practitioners are available to assist. Relax the mind, strengthen the body, and uplift the spirit with a morning yoga session overlooking the Bay, or soak up the healing benefits of a Thai Yoga massage. Castara’s golden beach is less than a five minute stroll away. Here, you will find safe swimming in the azure Caribbean, along with mesmerising snorkelling along the coral reef, sun loungers under the shade of palms, and local bars perfect for enjoying a chilled beer at sunset. You will see the fishing boats bobbing into the bay loaded with the daily catch, and the Seine fishermen who pull great nets onto the beach. This is a true spectacle, and anyone wanting to lend a hand is welcome. At sunrise, awake to the dawn chorus and watch the pelicans swoop over the ocean. Admire the hummingbirds hustling for space on the feeders, spot the rare agouti that has made its home in our gardens, and perhaps glimpse a school of dolphins passing the bay. Twilight brings the glow of fireflies, and you will see the stars rise and the moon casting its light onto the sea. When sleep beckons, you will be lulled to sleep by the sound of the waves. This is a place alive with nature and buzzing with life. We just fell in love with Castara Retreats, the village and it's locals, but it is hard to put into words just how special it all is. The accommodation is just stunning and equipped with everything you could need, This was our first Caribbean holiday and I think we struck gold. Although we do not usually make return trips to our holiday destinations this will be the exception. I cannot think of anything I would want to change about this beautiful piece of paradise or it's way of life, it really is so very special - stripped back Caribbean in all it's glory. Castara Retreats is one of my favourite places in Tobago. The owners ethos of making the hotel a part of the community is inspirational. They don't serve breakfast to encourage guests to go into the village and buy breakfast there and interact with locals. The rooms are more like self contained villas and have everything you could possibly need. They are spacious, tasteful and private, none overlook any others. All of the rooms were handbuilt which makes this property even more impressive! The service is first rate, everyone is personable, friendly and happy! I can't recommend it enough - fantastic place. Located at the heart of Castara Retreats, Caribbean Kitchen offers open-air dining with panoramic views to the beach, ocean and rainforest. It is a magical spot for watching hummingbirds over a light lunch, savouring the sunset over cocktails, or enjoying a candle-lit dinner listening to the lapping of the waves. Open daily for drinks, light bites and dining, Caribbean Kitchen is a place to find engaging conversation with like-minded guests, and a central spot for seeking support from our team. Our chefs – Keisha and Karim – are passionate about fresh, locally sourced ingredients, and their menu celebrates the flavours for which Caribbean cooking is known. We champion the fresh fish caught daily and brought in on the small fishing boats. Whether it’s red snapper, kingfish, or barracuda, we serve our fish succulent and ‘just cooked’. Keisha heads up our bar, and is known for her big smile and for mixing a mean cocktail- don’t miss her passionfruit mojito! Each accommodation has a fully equipped kitchen and wonderful spots for al fresco dining. With the village just a few minutes’ walk away, a choice of characterful eateries and bars are on your doorstep. We purposefully choose not to serve breakfast, encouraging guests to make their way into the village and soak up the local scene. For many, morning begins with a wander down to Cheno’s Café, where coconut bake, scrambled eggs, and salt-fish is guaranteed to get the day off to a good start. We are proud to work as an intimate, family run eco-resort, led by our local partners who have a stake in the business. A huge number of guests testify to the warm and friendly atmosphere that they experience during their stay. This is an integral part of our ethos and our team regularly describe the Castara Retreats staff as ‘one family’. Guests are welcomed into this culture, and often leave feeling part of the family too. We have strived to become an exemplar for sustainable tourism in the Caribbean, and are committed to evolving as an eco-resort and Tobago hotel that takes a responsible approach to the development of our enterprise, to the surrounding environment, and to the local culture. We champion Castara as an authentic Caribbean destination which has retained its identity and traditions, whilst responding to the opportunities of tourism. In the village are local services to be enjoyed – from boat trips and sunbed hire, to limin’ in bars and eating out local style. Promoting these services is part of our ethos and guests love to spend time in the village and contribute to its economic wellbeing. In return, they have an insight into the life of a Caribbean village. This approach creates a virtuous circle of sharing and good feeling that positively resonates among Castara locals and visitors alike. We are thrilled to be putting together an exciting programme of yoga and wellness retreats for 2019. C0nfirmed retreats to date are a vinyasa restorative yoga retreat with Karen Shelley (4 – 9th May), and returning teacher Troy Hadeed’s yoga immersion retreat ‘Listen’ (19-25 May). The package prices include accommodation, all meals, and yoga teachings. Check Check out our Wellness Page for more information or contact us. In October, Gabriela Lerner’s inspirational Raw Love Awakening retreat will bring together delicious nutrient-rich raw vegan cuisine, alongside group coaching sessions, Kundalini yoga, mindfulness exercise, discussion evenings, and meditation. 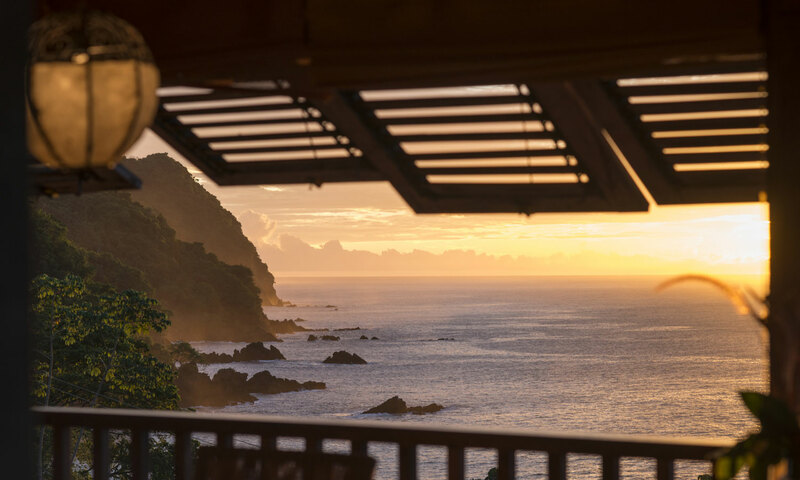 The retreat is designed to help participants connect on a physical, mental, emotional, and spiritual level, bringing a deep sense of connection and abundance, all in the unspoiled tropical location at Castara Retreats. Find out more here. As part of our re-branding project, we invited our talented sign-writer friend Jesse Watkins to paint all of the new signage for Castara Retreats at Caribbean Kitchen. She brought fabulous creativity to the project and has done a beautiful job hand-painting bright, colourful and unique new signs all around the property.